Fires in the home kill hundreds of people in the UK every year. Small fires are more common, but they can still cause serious injuries and damage homes and possessions. Make sure candles are in secure holders on a surface that doesn’t burn and are away from anything else that could catch fire from the candle flame. Health and safety advice pack. 1. How can you assure that me and my family are safe from fire in the small block I live in? We carry out regular fire risk assessments in all communal areas in the blocks and sheltered schemes we own. Any actions identified are dealt with in a timely manner and blocks and schemes are regularly checked by our housing officers. It’s important that you ensure that all corridors are clear from obstructions and rubbish as these are your escape routes in the case of an emergency. 2. Should I follow the ‘stay put’ guidance? Yes. 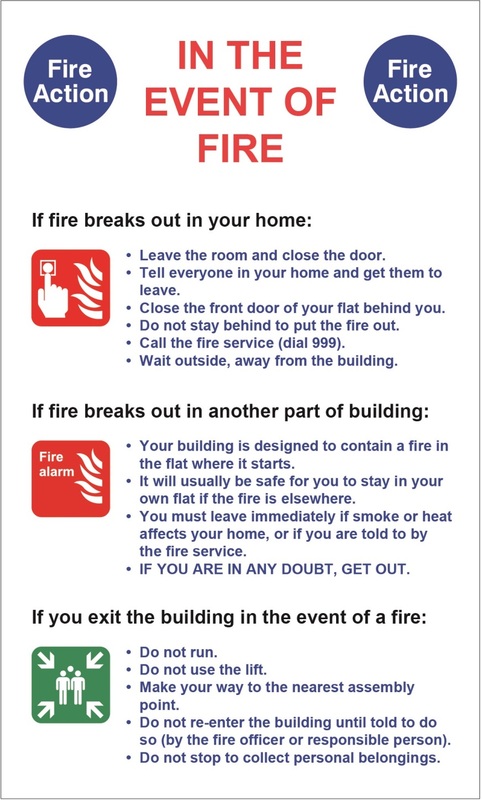 Please take time to read the ‘Stay Put’ guidance (below) which you should follow in case of a fire. If you are directly affected by smoke or fire in your own flat then you should leave immediately. 3. Where can I find the evacuation procedure? Fire safety procedures are issued to all new customers as part of their introductory sign up pack. They can also be found on Fire Action Notices which are posted in your communal stairwells, usually located near to the entrance/exits. 4. My building has recently been refurbished, am I at risk? All refurbishments are carried out in accordance with strict building regulations and approved by the relevant authorities. Any newly fitted communal fire safety alarms are commissioned and then tested weekly to ensure they are fully functional. 5. Is my front corridor door going to provide enough protection for me? All of our doors are to the standard recognised at the time of construction and are upgraded on a works programme. When upgraded they are fire rated to 30 minutes protection. 6. Is my building 'fire compartmentalised', i.e. designed to prevent the spread of fire between flats? All of our premises are inspected periodically to assess whether they meet current building regulations for fire compartmentalisation which should offer between 30 - 60 minutes of fire protection. 7. How do I ensure my smoke detectors are working? You can press the test button yourself to check your detector is working. It is recommended that you check your own alarms weekly. 8. Is the communal building fire alarm checked regularly? Yes communal fire alarms are tested on a weekly programme. If you are unable to hear the fire alarm during the test please speak with your housing officer. 9. Should I use the communal lift during a fire? If the fire alarm activates most lifts will automatically be taken out of service so even if you press the button to call the lift it won’t come. 10. What if me or my families personal health has changed and we might struggle to escape a fire that blocks our exits? If it’s safe to do so stay in your flat. Use your phone to inform emergency services and go to the window so that you can be seen from outside. If in doubt always dial 999 for a fire emergency. 11. Where can I find further information?